The Midwest is a favorite destination for those who are interested in antiques, collectibles, and nostalgia, and no Midwestern state has more to offer than Missouri. From enormous antique malls to corner shops, everyone who loves days gone by will find something in a Missouri antique store. Here are the 10 best! Rangeline Antique Mall was recently nominated as the Readers’ Choice Favorite Antique Mall of the 4 States (Missouri, Kansas, Oklahoma, and Arkansas), due to its vast and eclectic collection of antiques, collectibles, and vintage items from all over the region. Many shoppers say it’s the perfect place to go if you need to find a unique gift for someone special. Branson is a unique place, with its mixture of down-home country goodness and show-biz glitz, and its antique stores are a proud part of that tradition. The Apple Tree Mall is located on “The Strip,” Highway 76 in Branson, where most of the shows and attractions in Branson are also located. There’s no better place to browse while you’re waiting for your curtain time—but be careful, the booths are filled with such great antiques and crafts that you might miss your show! Hermann’s Attic is part of the quaint, old-fashioned town square in Hermann, Missouri, known for its romantic B&Bs in the heart of Missouri wine country. Everything from the building to the antique cars parked in front of it makes the shopper feel like they’re stepping back in time, and the interior contributes to the deja vu. Visiting Hermann’s Attic can be the central event in a trip to Hermann, or it can be part of your enjoyment of the whole region. The Brass Armadillo, just outside the Kansas City limits, isn’t just one of the best antique shops in Missouri, it’s one of the best ones in the United States. It features over 500 independent dealers filling a cavernous 42,000-square-foot space, and is a prime location for antiquers and collectors—both amateur and professional. In a major metropolis that already has multiple tourist draws, The Brass Armadillo is definitely one of the top sites bringing people to the city from all over the country—and all over the world. The Fox and Hound sounds more like a pub than an antique store, and there is a similar homey atmosphere about it. It’s a quaint plantation-style mansion in St. Charles, which is already known for its old-world charm. In a place made for memories, the Fox and Hound stands out, with it collections of classic furniture, apparel, and jewelry. The mansion is also available for weddings and other photographable moments, when you just want to tap into something timeless. Apple Wagon Antique Mall doesn’t boast the vast size of some of the stores on this list—though its 125 booths are nothing to sneeze at—but it does offer some very specific antique and vintage items that are difficult to find anywhere else. It caters to those interested in eclectic collectors’ items such as vintage fishing lures, unique depression glass, and Fiestaware. People travel from all over the region to get the specific collectibles and all the other high quality items sold at Apple Wagon. Annie Laurie’s bills itself as “An Eclectic Emporium,” and they aren’t wrong. 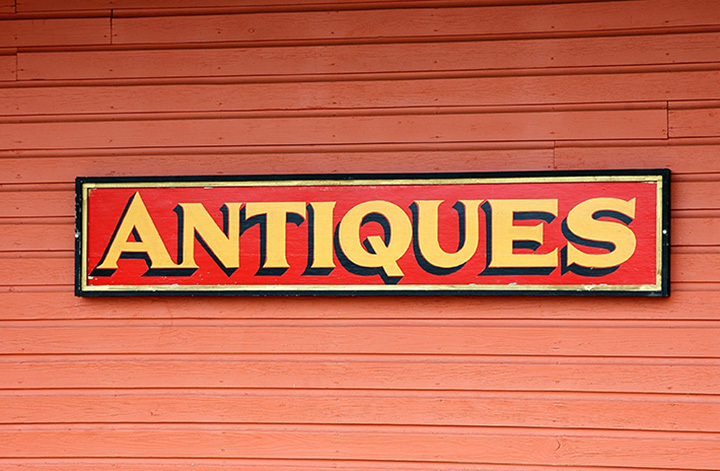 Spread out over 5,000 square-feet and two floors in historic Cape Girardeau, this antique store boasts not only collectibles, but fine antiques and rare vintage items. Annie Laurie’s has been featured in Southern Living Magazine, SEMO Antiques, and Palm Beach Antiques, and they have the quality inventory that bring people in from all over the country. If you can’t make it to historic Cape Girardeau, you can order your favorite items from the website. The River Market District in Kansas City has one of the most eclectic and culturally interesting collections of attractions in the country. It has an enormous farmers’ market, museums, bookstores, and especially, antique stores. There are many of them, and the whole district is more than worth an antiquer’s time. But the best antique store in the district is River Market Antiques, with its three stories spread over 30,000 square-feet. If you’d like to get to know the individual vendors, check out their website, where you can get a little biography of everyone who rents a booth in this beautiful space. Parking can be found in the lot overlooked by the Lewis and Clark mural. Downtown Antiques in West Plains features over 70 booths, but it is more remarkable for the fact that the building itself is an antique. Built in 1914, the building features the original native brick, high, pressed-tin ceilings, and polished hardwood floors. In addition to the stunning architectural features, the various booths offer displays of depression glass, Victorian furniture, and Indian artifacts, which you can enjoy as you sip a cup of coffee at their in-store café. If you’re going to Relics, you’d better have all day—at 90,000 square-feet, it bills itself as the largest antique mall in Missouri. Relics has every kind of booth, every kind of antique, and every kind of collectible imaginable, from 17th century French to 1980s kitsch. It is one of the best destinations in the region for hard-core antiquers with thousands to spend on the exact right piece, but it also offers an enjoyable afternoon for those who wander through with just a little pocket change. Almost as famous as the collection of antiques and collectibles is the Relics Tea Room, which offers delicious sustenance to those who want to take a break from their serious shopping.